What is Coolant Made of? Its higher boiling point allows the engine to run at higher operating temperatures, increasing efficiency and performance. Prevents engine damage to components and gaskets from corrosion. Without coolant, the amount of heat produced from the moving parts of the engine would cause the engine to overheat, resulting in extensive damage. Since the majority of mechanical issues are caused by overheating engines, the cooling system should be inspected every 30,000 kilometres or sooner to ensure that the radiator, water pump, hoses and thermostat work well. Maintaining the level of coolant in your vehicle is a key component in avoiding major auto repairs to these vital parts. If there is a coolant leak, you should have your mechanic check this out immediately. Bring it to the closest Master Mechanic auto repair shop to have this inspected. Our experts are equipped with the best tools and resources to give our best recommendation towards repairing your vehicle. 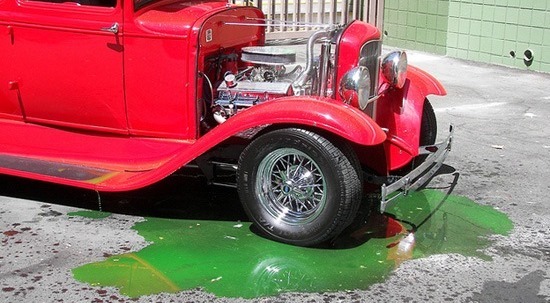 If you’ve noticed a puddle of green, orange or purple fluid under your vehicle after it’s been parked, that would be the first indication of a possible coolant leak. Call one of our experts at Master Mechanic to discuss the issue before driving the vehicle again. Depending on the severity of the issue and the distance the car would need to be driven, we sometimes recommend the car be towed to the shop to avoid any damage from the engine overheating. 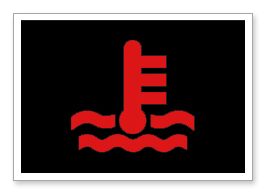 The coolant warning light will appear on your dash, indicating that the coolant level is low. Although your vehicle could appear to be running normally with the indicator light on, you should not continue to drive until your coolant and cooling system is inspected by a mechanic. Your vehicle’s engine could be at risk for overheating and receiving extensive engine damage if there is not enough coolant to regulate the temperature of the engine. Spots and discolouration that can be seen on the radiator may be caused by fluids that are leaking from the radiator. The fluid can land on the hot parts of the engine and quickly burn off, leaving discoloured spots which can begin to rust. If you are experiencing any of these issues which indicate a coolant leak and you need to get to your closest Master Mechanic, sometimes adding a bottle of water to the coolant reservoir will be just enough to get you there. However, water is not merely enough to consistently keep the engine cool. In high temperatures, the heat from the engine will cause the water to evaporate and boil it off too quickly, hence the reason for the antifreeze. In the winter, the antifreeze keeps the water from freezing, allowing it to move through the radiator. If you’re experiencing a coolant leak or for more information on your vehicle cooling system, contact your local Master Mechanic. < Is Your Car’s Air Conditioner Not Working?